Many unknown plants, animals, and microbes have found a way to survive against the odds. Some are discovered and there are many that remain undiscovered and hidden from the human eyes. The Suny College of Environmental Science And Forestry (ESF) has released a list of top 10 new species - the large and small, beautiful and bizarre are among the newly discovered animals, plants, and microbes - for 2018. The large is a majestic tree that towers up to 130 feet (40 m); among the small is a tiny, single-celled protist. The list of science's best discoveries includes a rare great ape and the fossil of a marsupial lion that roamed Australia in the late Oligocene Epoch. There are also two residents of the world's oceans - a fish from the depths of the Pacific Ocean and a bright amphipod from the chilly waters of the Antarctic Ocean. The 11th annual list, compiled by ESF's International Institute for Species Exploration (IISE), also includes a beetle that looks like part of an ant, a plant that partners with a fungus, a bacterium that looks like hair, and a beetle that resides in the dark and has an interesting evolutionary story. In addition to the two ocean dwellers, the new species hail from countries around the globe: Brazil, Costa Rica, Sumatra in Indonesia, the Canary Islands in the Atlantic Ocean, Japan, Australia, and China. And one was found in an aquarium in the United States - its origin in the wild is not known. "I'm constantly amazed at how many new species show up and the range of things that are discovered," said ESF President Quentin Wheeler. The legume genus Dinizia was known, until now, from a single Amazonian tree species, D. excelsa, discovered nearly 100 years ago. Dinizia jueirana-facao, up to 130 feet (40 m) in height, emerges above the canopy of the semi-deciduous, riparian, pristine Atlantic forest where it is found. This massive tree, weighing an estimated 62 tons (56,000 kg), is smaller than its Amazonian sister-species and lacks its buttresses, but is similarly impressive. D. jueirana-facao is known only from within and just beyond the boundaries of the Reserva Natural Vale in northern Espirito Santo, Brazil. While large in dimension, the tree is limited in numbers - it is known from only 25 individuals, about half of which are in the protected area, making it critically endangered. The woody fruits are impressive in size, too, reaching about 18 inches (0.5 m) in length. This amphipod, about 2 inches (50mm) in length, Epimeria quasimodo, is named for Victor Hugo's character, Quasimodo the hunchback, in reference to its somewhat humped back. It is one of 26 new species of amphipods of the genus Epimeria from the Southern Ocean with incredible spines and vivid colors. The number of species, and their extraordinary morphological structures and colours, makes the genus Epimeria an icon of the Southern Ocean that includes both free-swimming predators and sessile filter feeders. The genus is abundant in the glacial waters circulating south of the Polar Front and their crested adornments are reminiscent of mythological dragons. Nymphister kronaueri is a tiny beetle that lives among ants. At about 1.5 mm in length, 16 of them could line up head-to-tail in the space of an inch (2.5 cm). But their story gets much better. They live exclusively among one species of army ant, Eciton mexicanum. The host ants, as with other army ants, do not construct permanent nests but are nomadic. In the case of E. mexicanum, they spend two to three weeks on the move, making raids each day to capture thousands of prey items, then spend two to three weeks in one location. While the beetle can move about and feed while the host colony is stationary, it must make the trip with the ants when they are on the move to a new location. The beetle's body is the precise size, shape, and color of the abdomen of a worker ant. The beetle uses its mouthparts to grab the skinny portion of the host abdomen and hang on, letting the ant do the walking. At a glance, an ant with the beetle onboard appears to have two abdomens but the upper one is a beetle. Like other myrmecophiles (literally, ant lovers), these beetles must use chemical signals or other adaptations to avoid becoming prey themselves. The eastern and western gorillas, chimpanzees and bonobos are more closely related to humans than the orangutans which are the only great apes in Asia. 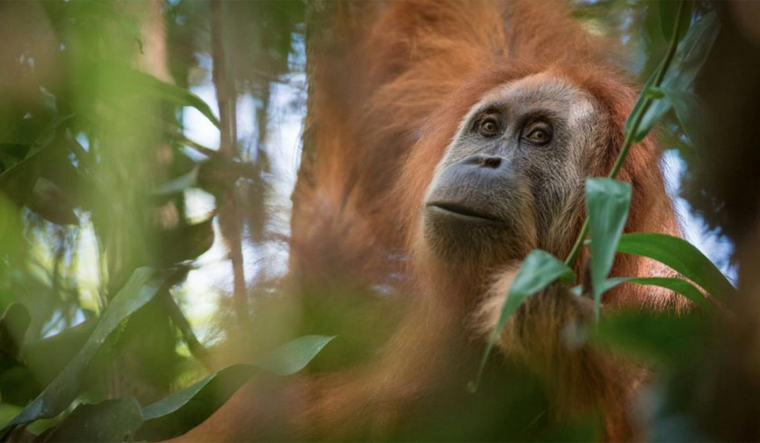 In 2001, the orangutans of Sumatra and Borneo were recognized as distinct species, Pongo abelii and P. pygmaeus. Genomic evidence suggests that while the northern Sumatra and Borneo species separated about 674 thousand years ago, this southern Sumatra species diverged much earlier, about 3.38 million years ago. As soon as the significance of this isolated population was determined, it revealed the most imperiled great ape in the world. Only an estimated 800 individuals exist in fragmented habitat spread over about 250,000 acres (about 1,000 square kilometers) on medium elevation hills and submontane forests from about 1,000 to 4,000 feet (300 to 1,300 m) above sea level, with densest populations in primary forest. Size is similar to other orangutans, with females under 4 feet (1.21 m) in height and males under 5 feet (1.53 m). In the dark abyss of the Mariana Trench in the western Pacific lies the deepest spot in the world's oceans and the deepest-dwelling fish ever discovered with verified depth. Large numbers of the new species were attracted to traps baited with mackerel. Pseudoliparis swirei is a small, tadpole-like fish measuring a little over four inches in length (112 mm) yet appears to be the top predator in its benthic community at the bottom of this particularly deep sea. It was captured at depths between 22,000 and 26,000 feet (6,898 and 7,966 m). A fish was recorded on camera at an even greater depth, at nearly 27,000 feet (8,143 m) but it was not recovered and could not be confirmed to be the same species. P. swirei belongs to the snailfish family, Liparidae. Among the family's more than 400 named species are fish found at all depths, from intertidal pools to the deepest reaches. It is believed that about 27,000 feet (8,200 m) are a physiological limit below which nearly all fishes cannot survive. Most plants are autotrophic, capturing solar energy to feed themselves by means of photosynthesis. A few, like the newly discovered S. sugimotoi, are heterotrophic, deriving their sustenance from other organisms. In this case, the plant is symbiotic with a fungus from which it derives nutrition without harm to the partner. In fact, the plant family Triuridaceae to which it belongs consists entirely of such mycoheterotrophs (fungus symbionts). The discovery of any new species of plant in Japan is newsworthy as the flora is well-documented, so such a beautiful new flower is an exciting addition. The delicate S. sugimotoi, just under 4 inches in height (10 cm), appears during short flowering times in September and October, producing small blossoms. The species is considered critically endangered as it has been found in only two locations on the island in the humid evergreen broadleaf forest, represented by perhaps 50 plants. Scientists found the first colonizers of this newly deposited area - a new species of proteobacteria producing long, hair-like structures composed of bacterial cells within a sheath, after the submarine volcano Tagoro erupted off in the Canary Islands in 2011. The bacteria formed a massive white mat, extending for nearly half an acre (about 2,000 square meters) around the summit of the newly formed Tagoro volcanic cone at depths of about 430 feet (129-132 m). Scientists reporting the new species concluded that the unique metabolic characteristics of the bacteria allow them to colonize this newly formed seabed, paving the way for the development of early-stage ecosystems. They dubbed the filamentous mat of bacteria 'Venus' hair'. In the late Oligocene, which ended about 23 million years ago, as the Miocene arrived, a marsupial lion, Wakaleo schouteni, roamed Australia's open forest habitat in northwestern Queensland, stalking its prey. Scientists recovered fossils in the Riversleigh World Heritage Area in Queensland that proved to be a previously unknown fossil marsupial lion. Weighing in at about 50 pounds, more or less the size of a Siberian husky dog, this predator spent part of its time in trees. Its teeth suggest that it was not completely reliant on meat but was, rather, an omnivore. It is part of a lineage (the genus Wakaleo) that followed Cope's rule during the Miocene, increasing in size through time, possibly in response to larger prey that, in turn, evolved as the flora changed as the continent became drier and cooler. Based on their discovery, researchers believe two species of marsupial lion were present in the late Oligocene 25 million years ago. The other, Wakaleo pitikantensis, was slightly smaller and was identified from teeth and limb bones discovered near Lake Pitikanta in South Australia in 1961. Beetles that become adapted to life in the permanent darkness of caves often resemble one another in a whole suite of characteristics including a compact body, greatly elongated, spider-like appendages, and loss of flight wings, eyes and pigmentation. Such troglobitic beetles are a prime example of convergent evolution, that is, unrelated species evolving similar attributes as adaptions to similar selection forces. A new species of troglobitic ground beetle from China, less than half an inch in length (about 9 mm), is striking in the dramatic elongation of its head and prothorax, the body segment immediately behind the head to which the first pair of legs attached. Xuedytes bellus was discovered in a cave in Du'an, Guangxi Province, China. Like much of southern China, this is in a vast karst landscape riddled with caves and home to the greatest diversity of cavernicolous trechine ground beetles (family Carabidae) in the world.